Students - This poem grew from a failed knitting project. 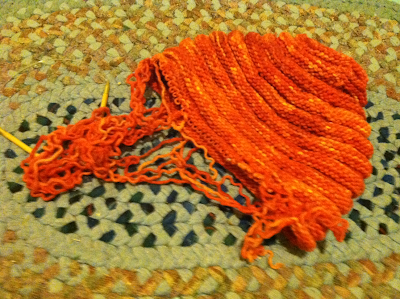 My orange wool hat was in the works for a while, but it failed on Monday evening. You can see it above. You can also see that I am tearing it apart to use the yarn again. The beehive hat you see here was going to be a Christmas present, and I was pretty proud of myself to be already thinking about Christmas and a homemade gift. Until. Until. Until I realized that there was not enough yarn to finish it. Everybody said, "Go get more yarn!" But I couldn't do it because this is a hand dyed skein from years ago. So I finished it with a hole in the top and wore it around for part of the evening, trying to convince myself and everyone else that it was a great "ponytail hat" and that sticking my hair out of the top looked great. But it didn't. And the hat was a little loose too. But I really wanted it to work, so I kept on telling myself that it would. It might not be good enough for a gift, but it would be good enough for me. But it wasn't good enough. I could do better. And those words of false praise I was telling myself were just that - false. Have you ever had this feeling - that you want something to be good just so that it can be finished...but you know deep inside that the work is not your best? I do not like that feeling at all. It feels like a sliver, just poking away at me. So I just started clipping and pulling at that hat, and now I'll unravel the whole thing to make something new. I want to make something with this cool orange yarn that I can be proud of. This happens with my writing too. I'll write and revise and revise and type and post a poem here. And then at 2:00am, I'll realize that something is off, and I'll come and fix it. It niggles at me. Ideas are worth good words. Great words. Just where we want them. So today I say this - be proud of your revisions. Tell your friends, "Look! I revised this! It was hard, but now it is better. I did the right thing." When I make mittens or a new hat with this wool, I will always know that those mittens or that new hat would never have existed if it hadn't been for this old beehive one. There will be the echo of this hat in the others, a shadow of the past in the future. It will still count. If you do work that you love, you will come to love the revisions too (in any work). Sometimes they may sting a little, but if you get right back to work - you will usually be glad that you did. Should any of you have revision discussions in your classrooms, you might want to use this poem to talk from. When did you feel fear in revising? When was it fun? What did you toss? What did you add? Talking with other writers is a healthy thing for all of us to do, no matter our ages. Today's poem, like Monday's, is a list poem. It is just a simple list with lots of repetition. It's a definition poem too, one that I have grown into. For at one time, revision was not my friend. Now, with every notebook and every poem, I love revision more and more. Revision is kind. If you are a notebook keeper, you will not want to miss Kate Messner's post over at Sharing Our Notebooks. Looking into the notebooks of generous writers can give us ideas for our own writing. FYI - Right now I am on the schedule to host this Poetry Friday. But I have traded with Betsy Hubbard. So if you keep the calendar in your sidebar, please note that change. Poetry Friday on October 12 at Teaching Young Writers with Betsy Hubbard, and I will host here at The Poem Farm on November 30. Perfect! It's so hard for students, and me, to let go of what seem like great words, a phrase, or even one word that was written. I think I will put this one in my notebook to help students (and me) to remember that 'good enough' isn't 'good enough', Amy. Thank you! I'm going to print out your poem and put it in my office where all of the news writers can see it. Some of my colleagues fight having their work edited, but I love the revision process, especially when an experienced editor gets hold of my work. The beekeeper in me is sad that the beehive hat is now just a memory of unraveled yarn. It would be so cute and SO WARM. Good luck on making it again. I've been busy writing in the notebooks I won -- thanks for the inspiration, Amy! I love it! Saving it in my poetry e-journal. But on the bright side, your revision poem didn't unravel at all! It's still tightly woven together and full of truth. If it were a hat, it would be warm and whole. Thank you for helping me with my revision lesson for tomorrow! I will show Peter Reynolds talking about being "uncareful," and we'll read your poem, and we'll do our best but now worry about getting everything perfect!